There’s no more universally potent an impetus for change than the onset of a new year. PATRICK LECLEZIO recommends a few adjustments to your potational proclivities. Another holiday bites the dust. They call it the FESTIVE season for good and obvious reasons, a description which for many – would it be ungenerous to say most? – extends to their consumption of distilled spirits. The period in which we now find ourselves, the calm after the storm, is a time of contemplation and reflection – hence the emblematic resolutions that are bandied about, with anything varying from iron resolve to gay abandon depending on the individual. I’d like to add to your list for 2014…if I may be so bold. My suggestion is in two parts. Firstly drink quality over quantity. Ok, I never claimed that these offerings would be rocket science, but simple as this may seem its application is not a foregone conclusion: it’s easy to slip back into old habits, and quality tends to cost, so price can be a deterrent (or an excuse). Fine, high-quality spirits enhance all the wonderful, positive attributes of the genre, whilst inhibiting its less savoury elements (responsible drinking shouldn’t be just a tagline). Secondly, try new drinks. There are a myriad of different spirits out there offering an array of different flavours – and most of them have a pleasing depth of heritage; it’s reassuring to know that something has evolved over hundreds of years, and that it’s been exhaustively tried and tested…and trusted. Hike out of the rut. Reach out and embrace the wonders of the spirituous world in their multitude. Here then is a short guide to get you started on your journey, to move you from vague generalities to actionable specifics. Carpe diem! I recently attended a delicious lunch during which KWV showcased their core range of premium brandies. The focus seemed to be on their new 12YO, which is admittedly very good, but my attention was drawn to the less fashionable 10YO – for various reasons: it’s a great, flavoursome brandy (I particularly enjoyed the tart apricot on the palate); it’s been selling at a ridiculously good price (good for us, not sure if it’s so good for KWV or for the standing of premium brandies – we’ll just have to trust that they know what they’re doing); and, most compellingly, it’s signalling a promising shift in the industry. I’ve written in the past about how I believe that South African brandy is being hampered by the presence of unmatured wine spirits in its compositions – a situation, by the way, which now only applies to the blended and vintage categories. Well done then to KWV for taking their 10YO and transforming it from vintage to potstill (100% pot distilled, matured brandy). This is the direction in which the industry should / must / has to travel. The vintage labelling however still remains on the bottles (and on the tasting notes provided to us at the lunch!) – I’m told that “they have yet to effect a label change” – which I find puzzling (disquieting? ); these types of product changes don’t happen overnight and I would have thought they’d want to shout this out. Regardless, ditch your coke and take the step up. Brandy may not have the range of a spirit like whisky, but there’s no shortage of ground to be explored – and explore it you should. Cognac is effectively a brandy produced in a designated region (the areas surrounding the town of Cognac in France), according to certain defined processes and regulations. The quality of South African potstill brandy bows down to no man, so to speak, but when it comes to luxury the French are still well out in front. 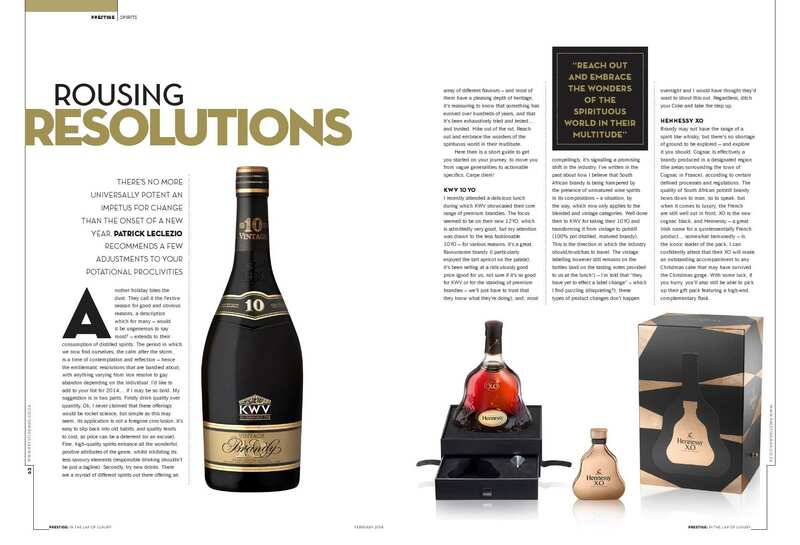 XO is the new cognac black, and Hennessy – a great Irish name for a quintessentially French product…somewhat bemusedly – is the iconic leader of the pack. I can confidently attest that their XO will make an outstanding accompaniment to any fruitcake that may have survived the Christmas gorge. With some luck, if you hurry, you’ll also still be able to pick up their gift pack featuring a high-end, complimentary flask. The proliferation of premium vodka over the last decade (and a bit) is remarkable, especially locally where premium white spirits have traditionally been the green, wet wood of the liquor industry. Last year witnessed the introduction of our own home-grown, big-brand premium vodka – Mainstay 54. Made from a distillation of “sun ripened molasses through a 5 column distillation process” – the type of vodka blah-blah which in my experience matters more to the perception rather than the actual quality of the liquid – this vodka actually does have an important point of difference from most of its synonymous brotherhood: the 54 denotes the alcohol by volume (ABV), well in excess of the category norm. The tangible benefits to you the drinker will be twofold: if you take your vodka in shots you’ll significantly boost your consumption experience, and if you dilute your vodka with a mixer you’ll extract considerably more value. The lower freezing temperature also makes Mainstay 54 the ideal beverage for one’s occasional Arctic expeditions – in fact I’ll write to them to suggest a change of advertising theme; clearly the tropical island settings are not doing the product full justice. I’m not a frequent liqueur drinker, but I’ve selectively come to both appreciate their worth and enjoy them on an occasional basis. Amaretto – a diminutive of the Italian word amaro (bitter) – is probably one of the oldest and proudest styles of liqueur in existence, dating its origins back to the early 16th century. Disarronno, supposedly the original amaretto and certainly the leading purveyor, is actually more bittersweet than bitter, and, unlike many others, it contains no almonds (or any other kinds of nuts); rather its signature fruity, nutty notes are derived from an infusion of apricot kernel oil. 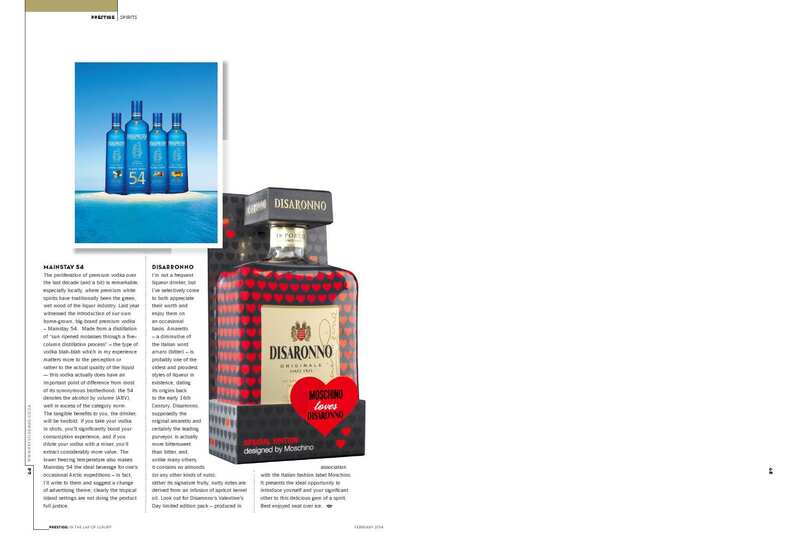 Look out for Disaronno’s Valentine’s Day limited edition pack – produced in association with the Italian fashion label Moschino. It presents the ideal opportunity to introduce yourself and your significant other to this delicious gem of a spirit. Best enjoyed neat over ice. This entry was posted in Spirits column and tagged Disarronno, Distilled spirits, Hennessy, KWV, Mainstay. Bookmark the permalink.